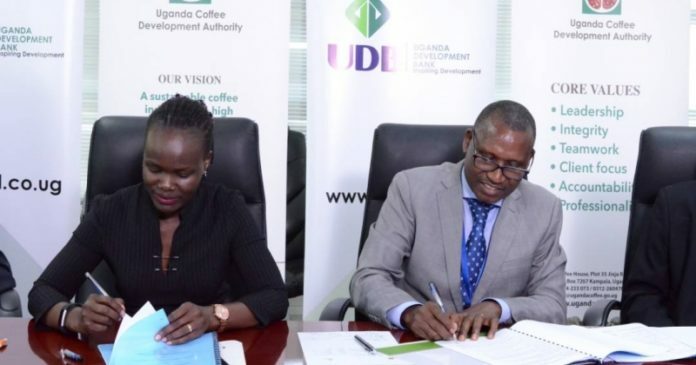 Uganda Coffee Development Authority and Uganda Development Bank Limited have signed a Memorandum of Understanding to accelerate production and export of Uganda coffee. The MoU formalizes and strengthens the existing relationship between UCDA and UDBL at the strategic and operational levels. It also focuses on the general principles for the cooperation of the two parties, the interaction between UCDA standards and the UDBL framework, the mechanism for mobilization of funds for lending and capacity building as well as sharing information regarding their partners in order to avoid duplication of roles. The move is in line with the nine transformative initiatives aimed at strengthening farmer organisations and producer cooperatives to enhance commercialization of smallholder farmers and ensure broad access to extension, inputs, finance and aggregation and promotion of value addition including primary processing. In her remarks, Managing Director of UDBL Patricia Ojangole welcomed the initiative which formalizes and strengthens the existing relationship between UCDA and UDBL. “I look forward to continuing to build on our constructive co-operation in the interest of enhancing overall economic development,” she said. Managing Director of UCDA, Dr. Emmanuel Iyamulemye said the partnership with UDBL is projected to go a long way in enabling the coffee sub-sector to achieve the target of producing 20 million bags in the stipulated timeframe. He said UCDA and UDBL have a shared objective of serving the public interest, “This MoU will enable the two entities to achieve common goals that will define and establish arrangements to mobilize, sensitize, train, organize, support, advocate for dealers and other actors at all stages of the coffee value chain,” he added.